"WRONG FUEL RECOVERY EXPERTS UK"
Putting the wrong fuel in your vehicle may not be covered by your vehicle breakdown company, insurance, or manufacturer’s warranty. As one of the leading companies specialising in fuel drain services within the UK, we offer an efficient and reliable solution to your problem, using the most up to date equipment to ensure that the wrong fuel is drained from your vehicle quickly and without fuss. All contaminated fuel is stored and transported according to Environment Agency regulations. It is then recycled, being used in the manufacture of biofuels and fuel heating throughout the UK. With over 50 specialist vehicles countrywide, we offer cover 24 hours a day, 365 days of the year. We carry out fuel drains at your location, allowing you to continue your journey as quickly as possible. All our technicians are fully trained and insured, giving you the benefit of knowing that you are in safe hands. 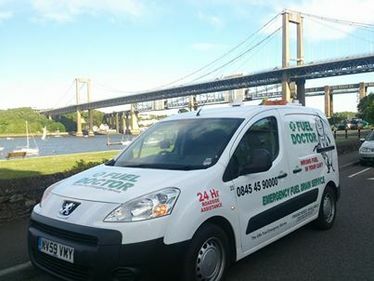 We do not subcontract any work – If you call Fuel Doctor then your fuel drain will be performed by a Fuel Doctor technician, whatever time of day it is. We can accept most credit and debit cards at the roadside with Chip and Pin terminals. If you have to pay for the service in advance over the phone then you are not dealing with Fuel Doctor! Most motorists facing this situation in the past felt stranded and unsure what to do, either stuck in a petrol station or broken down at the side of the road. Many breakdown and insurance companies recommend Fuel Doctor along with many other recovery companies because they know there is no company that can provide the same level of service nationwide. ​Our highly trained technicians can perform a safe and complete fuel drain on any vehicle at the customer's location. This service vastly reduces the cost and disruption to the motorist, changing a misfuel disaster into a mere inconvenience! Once more, we also accept all cards by the roadside, perfect when you don't have the cash to hand and another reason why we are so effective.